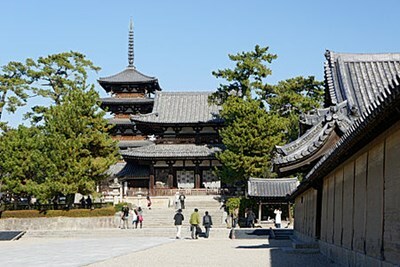 The UNESCO World Heritage Site Buddhist Monuments in the Hōryū-ji Area includes a variety of buildings found in Hōryū-ji and Hokki-ji in Nara Prefecture, Japan. They were designated in 1993 along with the surrounding landscape, under several criteria. The structures inscribed are some of the oldest extent wooden buildings in the world, dating from the 7th to 8th centuries. Many of the monuments are also National Treasures of Japan, and reflect an important age of Buddhist influence in Japan. This description uses material from the Wikipedia article on Buddhist Monuments in the Hōryū-ji Area and is licensed under the Creative Commons Attribution-ShareAlike License (view authors). Image by 663highland. 60 people want to do this. 7 people have done this.